Coal production the week ending March 10, 2012 was below the five-year range and 10% lower than the week ending March 12, 2011, according to weekly preliminary estimates from the U.S. Energy Information Administration and the latest quarterly production data from Mine Safety and Health Administration (MSHA). Warm weather this winter along with high stockpile levels and strong competition from natural gas depressed demand for coal by U.S. electric generators, which accounted for over 93% of total domestic coal use in the first nine months of 2011. Production declines were most pronounced in Appalachian coal basins where some mine operators (including Consol Energy, Royal Coal Corporation, and Alpha Natural Resources) have chosen to idle mines in the face of weakened demand. Coal production rose slightly in 2011, driven largely by exports of bituminous coal from the Appalachian and Interior regions to Asian markets. Flooding in early 2011 disrupted the coal mining industry in Australia, the world's largest coal exporter. 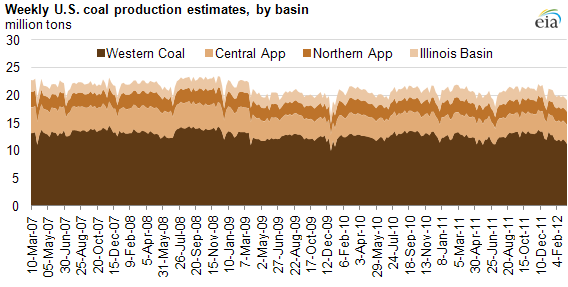 Australian production, however, returned to near pre-flood levels during the second quarter of 2011, dampening demand for U.S. coal on the world market. As of January 1, 2011, the DRB was estimated to contain 485 billion short tons. 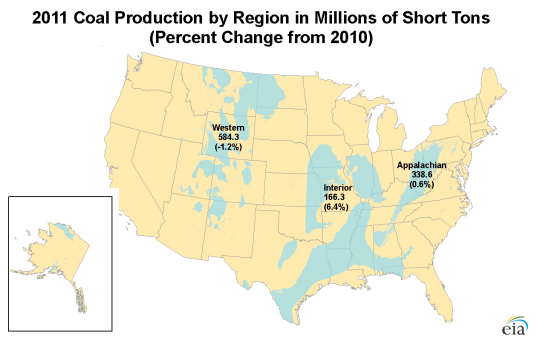 In the United States, coal resources are larger than remaining natural gas and oil resources. Annually, EIA reports remaining tons of coal in the demonstrated reserve base (DRB), which is comprised of coal resources that have been identified to specified levels of accuracy and may support economic mining under current technologies. Between 1990 and 1999, EIA obtained updated coal reserves information and data largely through its Coal Reserves Data Base (CRDB) program. That program encouraged State agencies to revise coal resource and reserves estimates in their respective States. These revised coal reserve estimates include improved analyses of coal quality, accessibility, and recoverability in the study areas. EIA used these new data to revise the DRB. EIA initiated a new coal reserves project in 2008 to incorporate existing reserves data into a geographic information system (GIS) based program. This system will include existing data, plus U.S. Geological Survey data, particularly for the Powder River Basin area of Montana and Wyoming. Recovery rates vary greatly between underground and surface mining. The actual proportion of coal resources that can be recovered economically from undisturbed deposits varies from less than 40 percent in some underground mines to more than 90 percent at some surface mines. In some underground mines, by design a portion of the coal is left intact as pillars to protect against surface collapse. Adverse geologic features in a mining area, such as folding, faulting, and inter-layered rock strata, can limit the amount of coal recovered at some underground and surface mines. Access to some coal is limited. Because of property rights, land use conflicts, and physical and environmental restrictions, EIA has estimated that only about 50 percent of the demonstrated reserve base (DRB) may be available or accessible for mining. EIA annually estimates recoverable coal reserves by adjusting the DRB to reflect accessibility and recovery rates in mining. As of January 1, 2011, EIA estimated that the remaining U.S. recoverable coal reserves totaled over 259 billion short tons (a short ton is a unit of weight equal to 2,000 pounds), from a demonstrated reserve base of 485 billion short tons. Recoverable coal reserves at producing mines represent the quantity of coal that can be recovered (i.e. mined) from existing coal reserves at reporting mines. These reserves essentially reflect the working inventory at producing mines. In 2010, the recoverable reserves at producing mines were 17.9 billion short tons. EIA conducts an annual survey, Form EIA-7A, “Coal Production and Preparation Report,” to gather and report the quantity of recoverable coal reserves at producing mines. Of the four ranks, bituminous coal accounts for over half (53.1 percent) of the demonstrated reserve base (DRB). Bituminous coal is concentrated primarily east of the Mississippi River, with the greatest amounts in Illinois, Kentucky, and West Virginia. All subbituminous coal (36.5 percent of the DRB) is west of the Mississippi River. Most subbituminous coal is in Montana and Wyoming. Lignite, the lowest-rank coal, accounts for about 8.8 percent of the DRB. Lignite is found mostly in Montana, Texas, and North Dakota.